As an aid to researchers, the Space Studies Institute is proud to release the texts of our member newsletters. Every issue is a trove of information. Some issues contain highly technical parts, but all are very readable. Start at the beginning and move along in order and you will come away with a “book” of value. We will be posting issues in order of publication, however it seems that we may not have a complete set. If a list for a year has holes and you have a copy in your collection that will help fill in any gaps, please contact us so we can arrange to add the content to the public archive. Your originals will be treated with great care and returned upon request. Mass Driver researchers take note that nearly every issue contains data for you. And here’s a tip: In the older newsletters the Mass Driver projects were labeled “mass-driver” with the hyphen, so when you use the site search feature try using the hyphenated version and you may find more references. This is an ongoing project, so please check back often to see more years being added. Looks like you might be missing 1983, Q4. That’s Vol IX, Issue 4. I happen to have this. Let me know where I can send it for you. Thanks Mike! We received the Q4 1983, the July-August 1984 and the March-April 1985. Scanned and transcribed and now filling in those blanks. 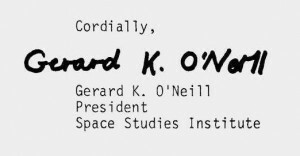 I really liked the Q4 1983 President’s Column where GKO’N talked about working with Disney on the EPCOT Horizons “ride”, seeing the Imagineerings so close to The Vision has always been neat for SSI members and to read of the background made it even better. (There’s a guy on eBay who sells a dvd of the full ride including the Colony ending.). The July-August 84’s VP Column and the “Getting Practical About Space” GEOSTAR Guest Column made me grab another cup of coffee and keep typing instead of going to bed early, and that mention in the March-April 85 UPDATE of the Soviet Solar Power Satellites made me wonder what – and who – would be powering the world now if the CCCP hadn’t fallen just a few years later. Correct things in the minds of good people eventually come around, maybe with the push of many citizen voices the U.S. or a friendly will ‘see the light’ of SPS before it’s far too late. There are many SPS articles in the newsletters, and we’ll be adding more SPS details to SSI.org site through 2016. Thanks again, Mike. Your Space Settlement website and the excellent Space Settlement FAQ remain classic go-to references and it’s great to have them archived by the NSS (http://www.nss.org/settlement/MikeCombs/ ). Let’s see what we can do to have it updated with the Move-In date of an Island ;-). SSI Senior Associate Tom Jolly has filled in a bunch of holes in the SSI Update archive. We just received 2 1991’s, 4 1994’s, 3 1995’s and 1 each of 1997, ’98 and ’99. Thanks Tom! We’ll get to converting and posting these as soon as we can!